Carl Froch and George Groves meet at Wembley on Saturday for their second fight, but it will have to be pretty special to live up to some of the greatest other reruns in the sport. When gnarled hacks are heard to utter, “This was a fight to end all fights,” you get a good take on how close to the limits of acceptability it was. This was the sort of brawl they used to have in Georgian fields, ungloved. 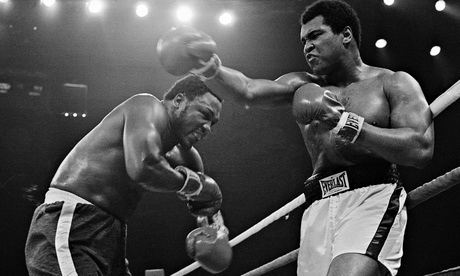 In January of 1974 (before the Rumble in the Jungle), Ali and Frazier engaged in a relatively tame second bout, after their epic Fight of the Century in 1971. But this was different. This wasn’t just a boxing match. It was a request beyond reason for two men to risk death. They were both unquestionably past their best, yet they found some of their best, as only they could, against each other, round after round. It is recorded that Ali won when Frazier quit at the end of the 14th. That is a mere technicality. Both men won, even if they surrendered a little of their souls. It was not just for a title. It was, as one observer put it, for, “the championship of each other”. Boxing often transcends the mere exchange of blows. Can any return fight have carried more external baggage than this one, though? Max beat Joe in the first one, belting him to bewilderment in 12 rounds in New York’s Yankee Stadium in 1936. Grown men wept in Harlem, said one writer. Now, retribution: but not just for defeat. Joe carried into the same ring two years later the hopes of western democracy against the perceived champion of Nazism, and he delivered him one of the most frightening one-round beatings in the history of the sport. He trapped the German on the ropes and raked his ribs with lefts (ringsiders heard him whelp) then crashed a right on to his helpless jaw, forcing a stoppage after a mere minute and a half. That’s called getting even. Eight years separated their first fight and the sixth, the finest brawl of all, fittingly in Chicago on St Valentine’s Day. It was as if the other five were mere preludes to an unforgettable climax. You only had to look at Jake’s already ugly mug afterwards to agree it was one of boxing’s massacres, the Bronx Bull pinned and helpless on the ropes in the 13th round, with one of the fight game’s most unforgiving matadors all over him. “Ya never put me down, Ray,” Jake is reckoned to have said to his familiar foe after the onslaught. Maybe he did. Raging Bull, the movie of his roller-coaster life said so, anyway. And, as LaMotta has repeated in many interviews since, “I fought Sugar Ray so often, I almost got diabetes.” He also got pretty well paid, which is why they were such willing partners in pain for so long. They met three times in 13 months – which, with hindsight, was asking a lot. Each fight was special. The third was the most fitting culmination of a trilogy any sadist could wish for. Ward won the first, Gatti the second - and then he prevailed again in this classic. But Gatti had the Boston fighter to thank for making it so unforgettable. Rarely have two boxers been so perfectly matched, stripped of subtlety and brimming with antagonism. When they squared off on the Atlantic City Boardwalk Hall, they had 20 mostly brutal rounds behind them, with another 10 to come. Gatti went down in the sixth, but found enough to thrash his way to victory. Ward has been immortalised in film already, in The Fighter. Reports this week say Gatti, who died in mysterious circumstances in 2009, is to get his own biopic. Few deserve it more.